There are several surf camps in Cantabria, but it is hard to find the one that will offer the best service and benefits at a reasonable price. This surf camp in Cantabria will offer a lot of flexibility when it comes to creating your own custom bundle package including surf classes and accommodation. It will also allow you to start and finish your stay in Bio Surf Camp on the days that you prefer. You will be provided six nights of accommodation during this surf camp. Staying in a conventional holiday resort is so impersonal. In Biosurfcamp, you will be steeped in a pleasant and friendly atmosphere from which friendship stems naturally from sharing breakfast, waves, and friendly experiences. If you are looking for a tranquil retreat, then Biosurfcamp is the ideal place. There, you will find a peaceful oasis where you can disconnect from the hustle and bustle of modern life. You will be offered many extras on top of simple and appealing accommodation. You will be able to enjoy the sauna, the BBQ, the surf library, bicycles, skates, longskates, slacklines, carveboards, and self-guided routes. Your stay in Biosurfcamp will be much more than only a place where you can sleep. Accommodation will be in an unbeatable natural environment without noise, a step away from the center of Suances and close to its beaches. There are different types of accommodation depending on your preferences. Additional services include the use of the kitchen, gazebos, sauna and contrasts shower, Wi-Fi, yoga area, barbecue, outdoor cinema sessions and screenings. Indoor surfing area with Slack-line, longskate, skate, indoboard, bosus and surf library with books, magazines, guides and specialized videos. This surf camp for adults has extensive facilities for the enjoyment of the guests. There is also a free loan material such as bicycles, skates, slacklines, and bosus. The camp includes a Zen garden, and a 2,000 square meter private organic garden at the entire disposition of the reduced groups. There are four cabins, a dome bedroom and several double bedrooms in tents with beds. There are the common zones like the kitchen, the canteen the barbeque, the sauna the pond and the terrace. There are bathrooms integrated with an interior shower just like the original outdoor showers attached to the sauna to have cold showers for heat contrast or to clean up after surf with a view of the sunset. The free material includes mountain bikes, indoor surf material (slackline, longskate and indoboards) and surftec. There are also high-quality surf equipment and qualified instructors with considerable surfing experience, as well as in the teaching of this sport and a very friendly, professional capacity that helps you learn using the sheer enjoyment offered by the waves. You will also enjoy many places where you can forget about routine stress and rest. There is an area for meditation and yoga that can be used at any time of the day, a dry sauna and outdoor contrast showers ideal for use after surfing lessons, as well as a natural meadow where you can lie down under the sun. This surf camp will provide you with a wide range of services during your stay. With the surf and accommodation package, you will also be able to surf on your own. You will be provided with a surf board, a wetsuit and straps, and you will be able to go and surf on your own as long as there are enough surfboards for the courses. In addition, you will be able to use the radiant sauna and its chromotherapy lighting and music system, ideal to recover your energy after surfing classes. There are also classes and workshops of relaxation, functional training, and surf study. In those, you will learn about theoretical themes such as how to read the waves and forecast surfing conditions, the right time to get up on the board, the necessary and adequate equipment for each learner and more practical themes such as balance on the surfboard, paddling technique, and how to control your body to maneuver on the wave. This surf camp will also give you the chance to meet people from different parts of the world that share the same passion and enthusiasm to begin surfing or to improve their technique. That is why your surf camp in Spain, near Santander, is a melting pot of people that come from different places. You can be from Madrid, Barcelona, Germany, or the UK, Bio Surf Camp will welcome you and you will become part of the most environmentally-friendly surf camp in Spain. The packages include two and a half hour courses with all the material and insurance. The time of the course includes the displacements, the practice of the technique in the sand, the heating and the practice in the water. Surfing is the main engine of the camps. You will be taught surf courses from early morning until late afternoon. The small groups for the classes are created depending on surf levels and sea conditions. You will travel between the facilities and the beach by van. The duration of the classes is two and a half hours since you will leave until the return to the facilities. Bio Surf Camp stems from an idea of transmitting to the people who come to learn about the union between surf in Suances, surf in Santander, surf in Cantabria, and the natural environment of this region. The aim is to show that surfing is not only about the surf and the beach. In 1992, Bio Surf Camp set in motion this idea, developing different activities but always guided by the founding principles of the camp. Los Locos beach became their home. Since then, Bio Surf Camp has evolved with each new season, a process that has been widening the range of activities, combining leisure and nature. Currently, they are still working in this area, which is regarded as a Surfing Natural Reserve, offering activities that are related to the environment and to surf training and learning. The surf school in Cantabria uses surf as a tool to raise awareness of the surrounding environment and its importance in people’s daily lives. Bio Surf Camp is passionate about surfing, and they live it intensely, and they want to transmit this experience to those who come to visit their surf school in Cantabria. Los Locos is the perfect spot for beginners but also a challenge for the experienced surfers who have travelled the world and who are looking for the perfect wave, because they might find it in this corner of Cantabria. In Bio Surf Camp, they promote an innovative model of surf camp in Spain. Based on a combination of sport activities like surfing and accommodation that fits perfectly with its natural surroundings. 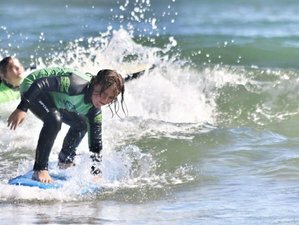 The summer camps consist of daily surf classes in the morning or in the afternoon in order to adapt to the best sea conditions, to the groups level, and to the learners wishes. Throughout the day, the vans will take the different surf classes to the best beaches of Suances. Small group classes take place in the beaches of La Concha, La Tablia, and Los Locos. The surfing equipment is approved for the Spanish surfing schools and are top brands such as Rip Curl for the wetsuits and NSP and Seasoft for the boards. There are surfboards and wetsuits in different sizes so that every surfer can find what they need. In addition to surfing classes, the surf camp offers different extra activities: theoretical classes on surfing, initiation to SUP surf or paddle surf. Moreover, if you just want to surf on your own, you will also rent surfing equipment so that you can enjoy the best waves in Cantabria. Biosurfcamp also provides stretching and relaxation classes, functional training on land, surfing world theories, and open-air movies to enhance this unique experience. The classes last a duration of two and a half hours daily in small groups with experienced instructors. You will learn fast with a progression geared to your level. The course includes all the necessary equipment, the shuttle to the beach, and the Civil Liability Insurance. All of the classes provide an explanation outside the water, a demonstration and technical practice on the sand. Everybody is given personalized advice on how to improve their techniques. The course finishes with a revision of all material covered during the camp. Pablo Ruiz Ramos has been surfing for 24 years, giving surf classes for 12 years, and working in the environment for 14 years. He has an official degree TD2 for surf. He coordinates all camp activities making sure you enjoy your stay and your experience with the whole staff. He welcomes you, shows you the facilities, and he can give you a surf class or even prepare breakfast. This surf camp will be held in Suances, Cantabria, Spain. Suances has some of the best surfing beaches in northern Spain, among which the Los Locos beach that stands out due to the high quality of the waves and its peculiar northwest orientation. It also highlights the beach of La Concha for its large area and the variety of its waves and breakers, perfect for the initiation near the shore and the improvement in the mouth and the most distant breakers. Also, Suances is located in a very central location, which allows you to reach Santillana del Mar and the Altamira Caves in 5 minutes, Comillas in 20 minutes and Santander or San Vicente in 30 minutes and Bilbao or Pots and Picos de Europa in hour and a quarter. In addition, Suances is the seaside town with the best parties in Cantabria, since every Wednesday, thematic parties are held in its streets and premises. Lessons take place on three of Suances big beaches: Los Locos, the best beach in Cantabria according to the “Guide of Surf and Skate 2016”. The La Tablia beach, 10/10 accordIng to “Surf Guide in Spain”, and the beach of La Concha for easier waves. You can take home a surfbook illustrating your best moments on the waves and at the camp. The camp is located in a green area near the village of Suances. 300 meters from the town center, the camp is in a pedestrian zone where there is no noise or traffic and almost no neighbors. You can always park just in front of the gates. It is a two-minute walk from the bars and restaurants as well as from shops and main facilities. The beaches are less than 1.5 kilometers away. It takes three minutes by car, 10 minutes by bike (available at the camp), and 20 minutes on foot along a stone path which goes through the old town. The packages include full buffet breakfast daily, including coffee, milk, cocoa, infusions, fruit, homemade sponge cake and bread, jam, butter, cheese, sausage, tomato, and juice. You can arrive at Santander Airport (SDR) or Bilbao Airport (BIO). Bio Surf Camp's representative will pick you up at Santander Airport (SDR) with an additional cost of 29 EUR. Airport: Santander Airport Airport transfer available: Santander Airport (US$33 per person) Additional charges may apply. You can request this in the next step. Bio Surf Camp is a group of surf and nature lovers who are dedicated to satisfy and fulfill the surfers’ need to reach the most intense wave in Spain. If you cancel the course, please notify Biosurfcamp at least 15 working days before the beginning of the course. In that case, you will be entitled to a 50% refund of the payment made. The remainder will be considered as administrative expenses. If the cancellation is notified less than 15 working days before the beginning of the course, you will not be refunded. Instead, the amount of the payment will be kept for a future reservation over a period (not exceed one year) and only in the low season. During this period, you will be able to choose a new date, as long as there are slots available on the requested dates.